Timothy Harding's "Powdered Graphite 2"
Guest blogger Gail Sachson , MFA, owns Ask Me About Art offering lectures, tours, program planning and consultation. She is Vice-Chair of the Cultural Affairs Commission and a member of the Public Art Committee. Maybe it’s the deep introspection one succumbs to during times of economic stress. Maybe it’s the stress itself. Maybe it’s youthful exuberance. Most probably it’s the juror, Charissa Terranova, Assistant Professor of Aesthetic Studies at UTD and Director of Centraltrak. Whatever the reasons, this year’s New Texas Talent show at Craighead-Green Gallery is zestier, riskier and stronger than I can remember in its 16 year history. Certainly the submissions are much more experimental than the hundreds of pieces I looked at when I juried about four years ago. This year, 43 works – paintings, sculpture, photography and installations – were chosen from 1,200 jpegs from 370 artists. If the show were to have a theme, it could possibly be “Playing with Space,” for much of the work seems to ooze out of its container, scale the walls, hug the floor or lunge at you. But it’s not an angry show. It is more about manipulation, construction and installation of traditional materials, seen in a new way. 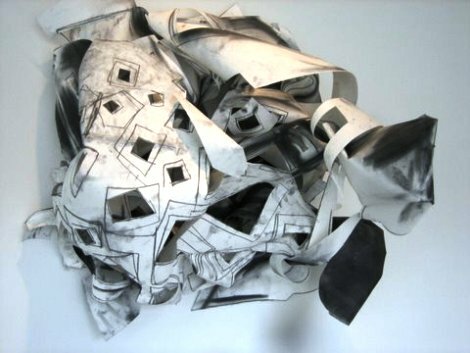 Timothy Harding explores the nuances of paper (top). He weaves and winds gessoed paper into what appears as a living, breathing organism. The powdered graphite marks, showing evidence of fingerprints and shoe prints, insist we recognize the manipulation process. Janet Morrow’s red organza work Hydra, waffles in the wind, er, the air conditioning. But it too seems alive. We avoid walking into it at the same time we want to caress it. 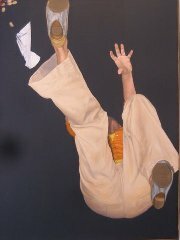 Even the two dimensional painting of a falling figure by Lois Giesler upsets our equilibrium and leaves us unsteady. Michael Christopher seems to ask us to join in and tempts us to rearrange the stack of paper cubes he has constructed that play with the space. Better ask permission. The entire show can be viewed online at www.craigheadgreen.com. Texas Talent XVI will be on exhibit until September 5.